Chava Benzion set out on her dream to become a midwife at age 20, while still livingin California. It took her 7 years to become a Licensed Midwife, recognized by the Medical Board of California. Three more years, and hundreds of births later, Chavah made aliyah (immigrated to Israel) with her husband and 2 year old son. They came directly to the north and after a two-year sojourn in a small yishuv, they moved to Safed. It didn’t take long for women in the small, close knit mountain community to find out that they had a midwife in town. Not only that, but the midwife was ready and willing to answer questions, give support, and accompany women on their journeys through pregnancy, childbirth, and beyond. Chavah started to develop a reputation as a good person to ask pregnancy and birth related questions to. Women would come to her and ask her to check the position of their babies, listen to the heartbeat, or assess the progress of a labor. Chavah knew that midwives play a main role in the hospital delivery rooms, but what surprised her was the realization that midwives have absolutely no role in the prenatal care framework. Pregnant women typically have a brief visit with a doctor a few times in the pregnancy to have an ultrasound and take some blood work, but no real education occurs and no strong connection is formed between mother and care provider. If the woman has a question or concern after-hours, there is no one to call or ask and they must wait sometimes weeks to speak to a doctor or go into a hospital to get any answers. This new awareness about the state of maternity health care in Israel was what inspired Chavah to create Ask a Midwife, Israel’s free English language online midwife support service. She created a website, a Facebook page, and a private, just for women Facebook group with over 500 members just since April 2014. She welcomes women to ask their questions about pregnancy, birth, babies, and beyond. She makes a point to help any woman she can, and does not require payment. If a woman has received valuable support and help through Ask A Midwife, she may decide to donate something to Chavah’s project as a way of saying thank you. Ask A Midwife does not claim to treat patients over the internet, and the advice and support that Chavah provides are not intended to be substitutes for care from the woman’s own doctor, but rather, to compliment it. Women can also benefit from the dialogue with other members almost as much or more than they benefit from Chavah’s advice. The nice thing is that since the comments are all midwife moderated, it assures that the advice and input from the other members are sound and will be held to a standard of a professionally trained midwife. 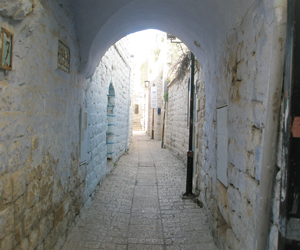 Ask A Midwife is based in Safed, but can be accessed anywhere in the world on line.